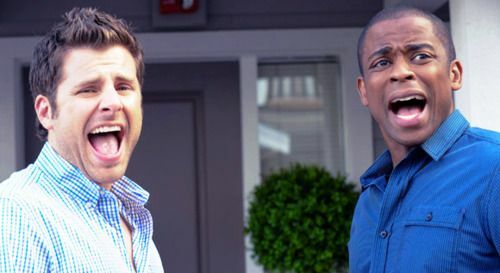 Even though Psych has been off the air for a few years, that doesn't lessen the love that Sky and I have for it. It remains a masterpiece of a comedy, and we will continue to love it even when there are no new episodes. But through all of this, the part of the show that has stuck out to us the most is Shawn and Gus's friendship. Why is it so wonderful? Here's why! Shawn and Gus enter American Duos together. They pretend to be former models together. They solve crime together. And they have fun doing it. They add excitement to whatever they're doing, and they realize that serious things do not always have to be serious. They love life, and that's what makes their friendship so compelling and interesting to watch. They're hilarious, and they've taught me some things about friendships and life. 2. They don't care what people say. Sure, people they know think they can be overly silly. People think they need to take everything more seriously. But do they care? Absolutely not. Because they do life in a way that they know works. Their friendship is strong. They solve every case they try. They're smart and talented, and man, they can be ridiculous if they want to. 3. They care about each other. They may not always give voice to how much they care about each other, but despite that, they really do. Shawn and Gus have been best friends since middle school, so their bond is strong. They're practically inseparable, and they will always be there for each other. Even when one of them is going to get married, the other will still be there right beside him. Always. 4. They know each other seriously well. Shawn and Gus know each other so well and can predict almost everything that the other is going to do. I wouldn't be surprised if they finished each other's sandwiches sentences. 5. They accept each other as they are. Shawn and Gus know each other so well, even each other's flaws, but they don't really care. While there's plenty of teasing involved, ultimately these two friends accept each other's various quirks and idiosyncracies. Shawn and Gus are opposites in such a way that they just make sense. Shawn's hyper personality and Gus's nervousness combine beautifully, and they work best as a team. It's like peanut butter and jelly. Green eggs and ham. Bert and Ernie. Bucky and Steve. Gus and Shawn. They are a perfect friendship and a perfect unit, not to mention a perfect crime-solving duo. Do you like Psych? How do you feel about Shawn and Gus's friendship? I LOVE THIS POST. I LOVE EVERY IMAGE YOU USED. It's perfect. It's beautiful. GOOD. These two are just adorable. I've only recently started watching Psych in the last couple of weeks (I started season 2 yesterday!) but this gives me a lot of confidence that I'm going to love them in the seasons to come, too. They're goofy, and I do love that, but I also love how they almost know each other better than themselves. :) That's so nice.